FUTA: Apply now for Ogun state Skill Acquisition Program... it's Free!!! 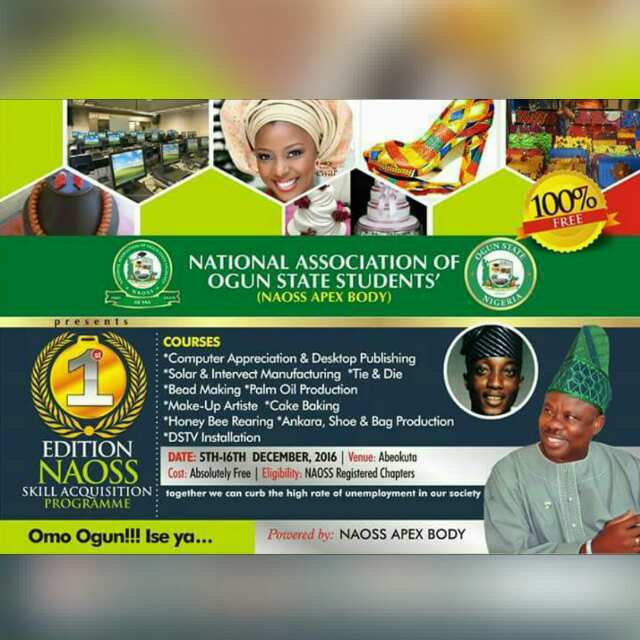 National Association of Ogun State Students' (NAOSS Apex Body), presents " The 1st Edition of NAOSS Skill Acquisition Programme". In a bid of NAOSS current Leadership to fulfill its electoral promises, part of which include organizing a skill acquisition program for students of ogun state origin, application are hereby invited from authentic students of ogun state origin to be beneficiaries of the 1st Edition of NAOSS (Apex Body) skill acquisition programme. It's view as a way of providing NAOSSITES with skills as an alternative to the unavailable white collar jobs before graduating from school. Computer Appreciation & Desktop Publishing (2weeks). Solar & Inverter Manufacturing (Duration - 2weeks). Tie & Die/Adire (Duration - 1week). Honey Bee Rearing (Duration - 1week). Ankara Shoes & Bags Production (Duration - 1week). Palm Oil Production (Duration - 1week). Make-Up Artist (Duration - 1week). Beads Making (Duration - 1week). Cakes & Baking (Duration - 1week). Date: 5th December - 16th December, 2016. Training Centres: Abeokuta, Ogun State. Cost of Form & Training: Absolutely Free of Charge. Forms are obtainable from Chapter Presidents from 1st-11th of November, 2016 and deadline for submission of forms is 18th of November, 2016. Successful applicants will be contacted through sms. Only registered chapters are eligible for this programme. Together we can curb the high rate of unemployment in our society.